When using Photometric lights, you need to disable Specular under "Advanced Effects" and enable Light Shape Visible in Rendering under "Shape/Area Shadows" in order to get the correct glossiness on your reflections (otherwise you will get fake specularity). 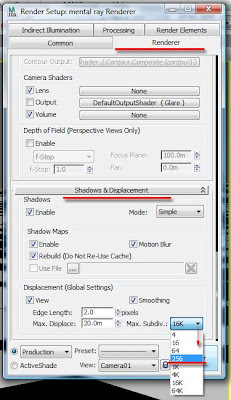 Also check the attached doc for a good overview of the shader capabilities. HDR can be used for reflection and to light the environment. You can use a blurred low res version of your HDR map for the lighting (much faster to calculate GI) and a sharp version for the actual reflections. For reflections you need to place the map under the Environment Map tab, for actual lighting you need to add a skylight to the scene and add the material to it. 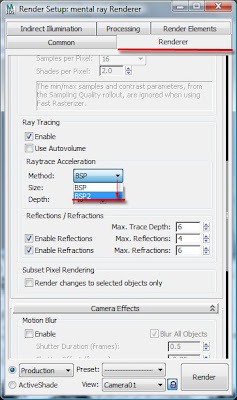 One thing that has minimized memory issues with MR for me has been setting Raytrace Acceleration (under the Renderer/Rendering Algorithms tab) to BSP2; Autovolume off. For the Translator Options, I generally do use MR Map Manager, but do NOT use Placeholder Objects or Conserve Memory. To solve this problem, simply open the renderer tab, on shadows and displacement parameters, under displacement (global settings), change the Max. Subdiv value to 1k or lower. This should be sufficient. Note that, values lower than 256 may result in a very faceted displacement (i.e. not accurate), so it is worth gradually decreasing/test rendering the values without compromising the quality too much. If you get artifacts similar to this when rendering a model it means your "Lightmap Size" is not big enough.